Ex hac editione omittuntur ludi duo quos Shakesperius partim tantum scripsit, Pericles, Prince of Tyre et The Two Noble Kinsmen. Or sporting Kid, or Marlowes mighty line. Ultimis verbis hic citatis eundem ludum Jonson repetit, verbis shake a stage, quo Robertus Greene usus est in opere suo Greene's Groat's Worth of Wit anno 1592 divulgato. 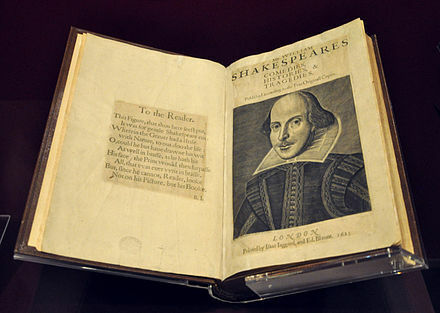 Ibi Shakesperium novum scriptorem vituperat, An upstart crow beautified with our feathers; ibi nomine gentilicio poëtae (quod alii saepe hyphene dividebant, Shake-speare) alludit et in Shake-scene mutat (scil. "qui scaenam quassat"). Vicimedia Communia plura habent quae ad editionem in folio Shakesperianam spectant. Jonathan Bate, "The Case for the Folio"
Alice Walker, Textual Problems of the First Folio. Cantabrigiae: Cambridge University Press, 1953. Novissima mutatio die 11 Martii 2013 hora 19:01 facta.